Photo negative. Oliver Family Photograph Collections. UC Berkeley, Bancroft Library. Berkeley, CA. BANC PIC 1960.010 ser. 2 :0426--NEG (5x7). "Salmon net reels, Kassan Bay, Alaska." In 2016, Chamoru poet Craig Santos Perez observed World Oceans Day on June 8th with a poem. He named the poem “Praise Song for Oceania,” and in it he lauded the “blue continent” to which his native Guam belongs. In one particularly powerful verse, he praises the ocean’s capacity for remembering “our migrant routes & submarine roots.” In the latter phrase, Perez referenced the work of Pacific Islander scholars who have advanced studies of the Pacific by their dual focus on rootedness and migratory routes. But it is not only Indigenous Pacific Islanders who have submarine roots; oceans and seas have played an indelible role in much of human history. One of the reasons why Perez’s work is interesting and unusual is the contrast it presents against the wealth of cultural media that portrays bodies of water as timeless and somehow outside history. Instead, “Praise Song for Oceania” recognizes the ocean as a deeply historical location. This basic cultural assumption that the ocean is ahistorical has produced a strong terrestrial bias in written history. Think about how you learned history in school. Did people or things tend to just teleport from one content to another without any explanation of how they got there, or why they departed or arrived by that route, or what the voyage meant to them? Certainly not all histories neglect the sea, but enough do that to make an effort to reorient the way you think about aquatic spaces can radically alter how you analyze a historic place or process that you thought you understood. This article examines aqueous approaches that historians have adopted toward the Pacific in order to assess oceans and seas as spaces and sites of conflict—and of cooperation. These oceanic histories produce exciting visions of the world and regions that reveal the solubility of modern boundaries and recognize how closely intertwined histories are across the world between different people and between people and their environments. French historian Fernand Braudel (1902-1985) posited that the Mediterranean Sea defined a cohesive region, and his approach allowed other historians to argue about the nature of regions. His magnum opus, the three-volume The Mediterranean and the Mediterranean World in the Age of Philip II (originally La Méditerranée et le Monde Méditerranéen a l’époque de Philippe II), represented his most assertive expression of this water-oriented regionalism. has displayed strong Braudelian influence into the twenty-first century. Braudel’s influence was profound in the early days of Atlantic History as a field. Historians of the Atlantic found that the societies that bounded and traversed it were too diverse for the ocean to define a single region in comparison to the smaller, more densely linked Mediterranean Sea, however. Instead, the subjects of Atlantic histories are often human migrations and the movement of commodities, including mahogany lumber, slave ships, and radical politics. for example, focus on the African Diaspora in the Americas and the role of genocide in the development of modernity in a triangular relationship between Africa, Europe, and the Americas. Two overlapping trends characterize Pacific history. The first of these are histories of empire and imperial expansion. Historians use the setting of Pacific lands and islands to interrogate the nature of imperialism and how empires exert control over landscapes and peoples. The second trend is indigenous-oriented Pacific histories. The indigenous approach takes its cues from the work of Epeli Hau‘ofa and other scholars largely based in Oceania. Matt Matsuda’s Pacific Worlds and David Igler’s The Great Ocean are the definitive large-scale survey texts of the field, while David Chang’s The World and All the Things Upon It is an excellent recent work of Indigenous maritime history that explicitly challenges orthodox narratives of discovery and colonialism in the Pacific. The Pacific Ocean contains some 25,000 islands, which helps to explain why Pacific Worlds historians prefer to focus on maritime societies rather than borrow the “highway” metaphor for waterways from Atlantic historians. Even so, historians on the whole considered the vast Pacific a barrier to be overcome and its islands small and isolated through the early 1990s. When Pacific Islander author and anthropologist Epeli Hau‘ofa published the essay “Our Sea of Islands” in 1993, however, he gave voice to a vision of the Pacific grounded in its long history of Indigenous voyaging. In converting “Pacific World” into “Pacific Words” these scholars assert that the borders of the Pacific Ocean on a map are inventions. There are no claims to cohesiveness among Pacific historians. Instead, they examine how the ocean has given form to a range of cultures and how migration and diaspora enact ancient histories of transit. These are histories in which the way back home is equally as important as the journey out. These are the Pacific’s roots and routes. Pacific Worlds scholarship is transgressive and often explicitly political. Its practitioners challenge modern political boundaries because they embrace geographies that predate and look beyond modern nation states, such as Oceania. The physical boundaries of a history in Pacific Worlds vary widely because the ocean is so large and diverse it defies neat generalizations. Yet another set of historians engage environmental histories of oceans. Environmental historians are interested in what goes on beneath waves. These histories “embrace the vertical,” in the words of Helen Rozwadowski, to examine the more-than-human marine communities that make up oceans and ecosystems. Environmental historians are also interested in the histories of oceans themselves. The ocean has a history “in which people have been inextricably involved” and rewriting maritime histories to consider the oceans as dynamic agents in human history could lead to reevaluations of people as ecological actors. These histories recognize that “humans have left imprints in places that seem remote from civilization—indeed, places that challenge human survival,” including the waters of the arctic circle or the bottom of Boston Harbor. There is not place on Earth, environmental historians write, that has not felt the impact of humanity and no human on Earth who is not part of an environment. Environmental historians have concerned themselves with the Pacific since the 1980s, when Alfred Crosby analyzed Australia, the United States, and New Zealand together in Ecological Imperialism. Other researchers such as Richard Grove in Green Imperialism, Tom Griffiths in Ecology and Empire, and, more recently, Jennifer Newell in Trading Nature have followed and expanded upon Crosby’s model of incorporating Pacific Islands and nations in environmental histories of imperialism. Other texts, most notably Gregory Cushman’s Guano and the Opening of the Pacific World, argue that particular ecosystems were themselves was crucial to the emergence of a colonial Pacific World. Another model of Pacific environmental history informed by the transgressive politics of Pacific Worlds scholarship is Lissa Wadewitz’s The Nature of Borders, which investigates the influence the US-Canadian border in the Pacific Northwest has had on natural salmon fisheries of the Salish Sea and Pacific. The Anglo-American border between the United States and Canada at the forty-ninth parallel was established by diplomats with “no consideration of ecological or biological factors,” she writes. This border marginalized salmon both economically and also culturally and created a contested and permeable social geography that fostered mistrust and competition on both sides that manifested in border banditry and fish piracy. In The People of the Sea, Paul D’Arcy likewise argues that the centrality of the ocean and maritime practices to societies of Oceania—and their consequent openness to exterior forces—significantly impacted the direction and pace of social transition in the colonial period between 1770 and 1870. The People of the Sea is an example of how environmental history and Pacific Worlds frameworks can come together in ways that center non-Western experiences and perspectives. How can you approach an ocean-based history from primary sources? First, find a collection of primary source material. Second, formulate a question that intrigues you. This question might be about how a resource or good from one part of the world altered culture or ecosystems in another, or about why a person or group of people might travel across an ocean. The next step is to begin to research that question and develop a thesis to explain it. An intriguing photograph is always a good place to start. The Bancroft Library digital collections contains materials related to Pacific ports. This image of a bear climbing the rigging of a ship is eye-catching, inspiring further investigation. What a bear might have been doing on a ship is unclear, but the album from which it comes presents some intriguing possibilities. In 1886, the family of amateur photographer William Letts Oliver travelled north along the Pacific coast to Alaska on the ship Ancon, a side paddlewheel steamer. If you think about how the Olivers’ trip up to Alaska as snapshots of larger histories, you might design a few different projects depending on how you choose to approach the subject. 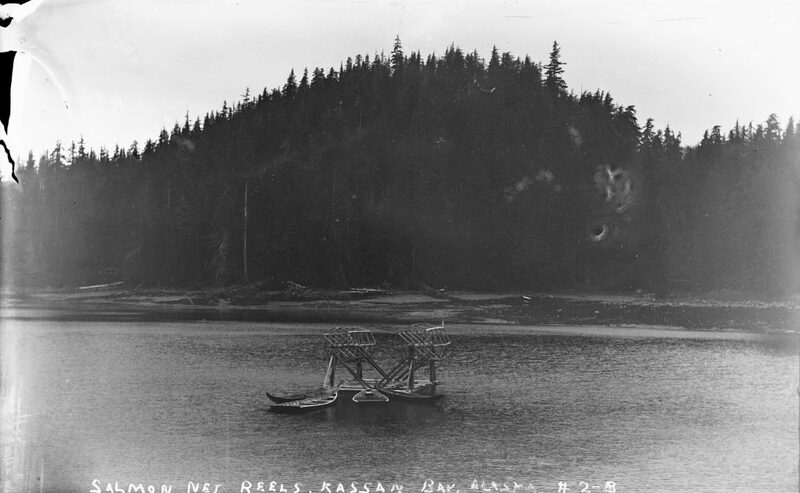 In the journey along the Inside Passage, the sidewheeler Ancon stopped at the Kaigani Haida village Kasa’aan, which the photographer identified as “Kasaan Bay.” The photographs taken there reflect the maritime orientation of the village, with canoes and even an old schooner on the beach and a modern salmon reel offshore. A Pacific Worlds study that incorporates the outing might look at how Haida lives were and continue to be lived in relation to the sea. Such a history would encompass the lands and waters not only Southeast Alaska, the location of Kasa’aan, but also into British Columbia and out into the North Pacific because the Haida Nation, centered on the archipelago of Haida Gwaii, extends across these boundaries. Non-Native nation states such as Canada and the United States arrived only recently in the Indigenous history of North America, which means that Native geographies, trade, law, and property transcend their borders. An environmental historian is likely to be intrigued by the sight of a bear on a boat—What, they might ask, was the place of living animals on ships of the Pacific coast?—but they may be as likely to express interest in the atmosphere, and want to include the Ancon in a study of steam power in the Pacific—such a history would likely eschew political boundaries altogether to organize the study instead around jet streams and the way air pollution travelled at the turn of the century. San Francisco Police Officer Jesse Brown Cook documented the construction of a sea wall and esplanade at Ocean Beach in a scrapbook. The photographic record of this artificial division of human residences from the more-than-human sea presents an excellent illustration of contemporary assumptions about the nature of borders and the terrestrial bias of historical thought in the United States. The bounded way of thinking that has led most historians to neglect seas reflects cultural assumptions that bodies of water are natural barriers, but maritime and coastal histories reveal that waterways are and have always been important avenues of connection that often subvert political borders. Karen Wigen, “AHR Forum: Oceans of History,” American Historical Review 111:3 (2006): 717-21. Matt K. Matsuda, “The Pacific,” American Historical Review 111, no. 3 (June 2006): 758-780. Jerry Bentley, “Seas and Ocean Basins as Frameworks of Historical Analysis,” Geographical Review 89, no. 2 (April 1999): 215-224. Blum, “The prospect of Oceanic Studies,” Publications of the Modern Languages Association of America 125, no 3 (2010): 670-677. Katrina Gulliver, “Finding the Pacific World,” Journal of the Pacific World 22:1 (March 2011): 83-100. Bernard Klein and Gesa Mackenthun (eds), Sea Changes: Historicizing the Ocean (2004). David Lambert, Luciana Martins, and Mile Ogborn, “Currents, Visions and Voyages: Historical Geographies of the Sea,” Journal of Historical Geography 32 (2006): 479-493. Isaac Land, “Tidal Waves: The New Coastal History.” Journal of Social History 40, no. 3 (Spring 2007): 731–743. Peter N. Miller (ed. ), The Sea: Thalassography and Historiography (2013). Helen M. Rozwadowski, “The Promise of Ocean History for Environmental History,” Journal of American History 100:1 (2013): 136-39. Philip E. Steinberg, “Of Other Seas: Metaphors and Materialities in Maritime Regions,” Atlantic Studies 10, no. 2 (2013): 156-169. Gregory T. Cushman, Guano and the Opening of the Pacific World: A Global Ecological History (2013). Richard Ellis, The Empty Ocean (2003). Richard H. Grove, Green Imperialism: Colonial Expansion, Tropical Island Edens and the Origins of Environmentalism, 1600-1860 (1996). Ryan Tucker Jones, Empire of Extinction: Russians and the North Pacific’s Strange Beasts of the Sea, 1741-1867 (2014). Helen M. Rozwadowski, Fathoming the Ocean: The Discovery and Exploration of the Deep Sea (2005). Lissa K. Wadewitz, The Nature of Borders: Salmon, Boundaries, and Bandits on the Salish Sea (2012). David A. Chang, The World and All the Things Upon It: Native Hawaiian Geographies of Exploration (2016). Alastair Couper, Sailors and Traders: A Maritime History of the Pacific Peoples (2008). Ben Finney, Voyage of Rediscovery (1994). David Lewis, We the Navigators: The Ancient Art of Landfaring in the Pacific (1994). Joshua L. Reid, The Sea is My Country: The Maritime World of the Makahs (2015). Nancy Shoemaker, Native American Whalemen and the World: The Contingency of Race (2015). Dorothy B. Fujita-Rony, American Workers, Colonial Power: Philippine Seattle and the Transpacific West, 1919-1941 (2003). Epeli Hau‘ofa, We are the Ocean: Selected Works (2008). David Igler, The Great Ocean: Pacific Worlds from Captain Cook to the Gold Rush (2013). Matt K. Matsuda, Pacific Worlds: A History of Seas, Peoples, and Cultures (2012). Ronald C. Po, The Blue Frontier: Maritime Vision and Power in the Qing Empire (2018). Vicente Diaz and K. Kehaulani Kauanui (eds. ), “Native Pacific Cultural Studies on the Edge,” special issue of The Contemporary Pacific 13:2 (2001): 315-342. Fernand Braudel, The Mediterranean and the Mediterranean World in the Age of Philip II, Sian Reynolds (trans.) (New York: Harper & Row, 1972). “East Asian seas” refers to the East China Sea, the South China Sea, the Yellow Sea, and the Japanese Sea. Angela Schottenhammer, “The East Asian ‘Mediterranean’: A Medium of Flourishing Exchange Relations and Interaction in the East Asian World” and Roxani Margariti, “An Ocean of Islands: Islands, Insularity, and Historiography of the Indian Ocean” in The Sea: Thalassography and Historiography, Peter N. Miller (ed.) (Ann Arbor: University of Michigan Press, 2013). Alison Games, “Atlantic History: Definitions, Challenges, and Opportunities,” American Historical Review, 111:3 (June 2006): 749. British scholar Paul Gilroy popularized the term “Black Atlantic” in his book The Black Atlantic: Modernity and Double Consciousness (Cambridge: Harvard University Press, 1993). Matt K Matusda, Pacific Worlds: A History of Seas, Peoples, and Cultures (2012); David Igler, The Great Ocean: Pacific Worlds from Captain Cook to the Gold Rush (Oxford: Oxford University Press, 2013); David A Chang, The World and All the Things Upon It: Native Hawaiian Geographies of Exploration (Minneapolis: University of Minnesota Press, 2016). Matthew K. Matsuda, “The Pacific,” American Historical Review 111:3 (June 2006): 760-61. Epeli Hau‘ofa, “Our Sea of Islands” in We are the Ocean: Selected Works, Epeli Hau‘ofa (Honolulu: University of Hawai‘i Press, 2008): 27-40. Igler, The Great Ocean, 11. Helen Rozwadowski, “The Promise of Ocean History for Environmental History,” Journal of American History 100:1 (2013): 138. Jeffrey Bolster, “Opportunities in Marine Environmental History,” Environmental History 11:3 (2006): 570-571. Alfred W Crosby, Ecological Imperialism: The Biological Expansion of Europe, 900-1900 (Cambridge: Cambridge University Press, 1986); Richard Grove, Green Imperialism: Colonial Expansion, Tropical Island Edens, and the Origins of Environmentalism, 1600-1860 (Cambridge: Cambridge University Press, 1995); Tom Griffiths, Ecology and Empire: Environmental History of Settler Societies (Seattle: University of Washington Press, 1997); Jennifer Newell, Trading Nature: Tahitians, Europeans, and Ecological Exchange (Honolulu: University of Hawaii Press, 2010); Gregory T Cushman, Guano and the Opening of the Pacific World: A Global Ecological History (Cambridge: Cambridge University Press, 2013). Lissa K. Wadewitz, The Nature of Borders: Salmon, Boundaries, and Bandits on the Salish Sea (Seattle: University of Washington Press, 2012), 7. Paul D’Arcy, The People of the Sea: Environment, Identity, and History in Oceania (Honolulu: University of Hawaii Press, 2006). C. L. Andrews, “Marine Disasters of the Alaska Route,” Western Historical Quarterly 1:7 (January 1916), 24.